Not all Barolo producers in the village of Monforte d’Alba share the surname of ‘Conterno’, but it’s quite likely! This Conterno family is related to that of Conterno-Fantino through father Diego – but unrelated when it comes to wine style! – & their new winery is ironically located just up the slope from Giacomo Conterno, of no relation. Diego, a graduate of the Umberto 1 Enological School, is well-grounded in making traditional Barolo, having worked under Beppe Colla at Prunotto. In 2000 Diego decided to sell his share of Conterno-Fantino, take his vines including the plum Ginestra plot, & started afresh. While 2003 was their first vintage as ‘Diego Conterno’, producing all of 1300 bts of Barolo (Ginestra), the family’s history dates back to the post WWII Baroli of ancestors Lorenzo & Attilio Conterno. 2005 witnessed 100% of the estate fruit being bottled. 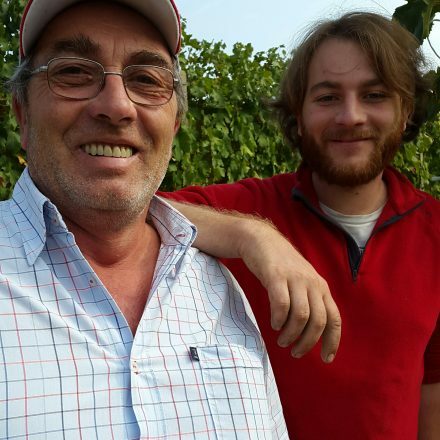 Father & son tend the vines & make the wines; Stefano joining in 2010 – the first year their Sori Ginestra was bottled separately! Aided by a new wing to their winery in 2014, allowing them a bit more space, Diego & Stefano are making classic Monforte Barolo: static fermenters (not rotos), cement & the use of increasingly large botte grande (another two due late 2016), to give broad, brambly & minerally pure Baroli. But perhaps the winery’s greatest surprise, apart from the profondita of their Barolo Ginestra, is the pineapply Langhe Nascetta, grown on grey marl soils – rich & minerally! Diego, his wife Anna & ‘children’ Stefano (27 & a surveyor by training) & Lorenza (now a nurse), have 7.5ha of vineyards located in the village; 2ha of which are in the ‘Grand Cru’ vineyard of Ginestra, the ‘Sori’ (full south) heart of which faces plum south at right angles to the sun & was planted in 1982. The remaining 5.5ha are split between Nebbiolo for Barolo vineyards of San Pietro, Pajana & Gris (grey in dialect on account of its fine grey marl soil); they also have Nebbiolo (d’Alba), Barbera, Dolcetto & Nascetta planted in the full west facing Ferrione vineyard below the winery itself. From vintage 2018, the family has begun renting a small parcel of Monforte Le Coste! Since 2010 all the vineyards have been converted to organic, & certified in 2014. 2017 Langhe Nascetta, Monforte d’Alba – tasted March’18 from s/s tank, 13.5%, Stefano & Diego chose to pull back on the skin maceration to 24hrs (from 36) on account of the delicate vintage. From 8 yo vines in their steep, grey marne Ferrione vineyard literally below the cantina, facing west & the snow-capped Alps. Stunning iridescent colour, the nose pings with steely cool lime & lemon pith aromas, perhaps even with a hint of ‘credo’, so almost (Etna) Carricante-esque! To taste glistening sherbet lime (dip), exciting, candied lemon, mineral tension & refinement, crunchy, distinctly salty/sapido, cool, dry. Only 4,500 bts produced in this dry year. 2016 Langhe Nascetta, Monforte d’Alba – c. 3k bts, this now local variety thrives predominantly among the villages of Novello & increasingly Monforte, where its exotic fruit is tempered by the grey marne minerally soils. Its roots lie in the Kingdom of Sardegna, once a dominion of the Sabauda family. The Conterno family have been making it since 2013 from a single vyd below the cantina, facing the Alps! S/steel fermented with two days on the skins, 13% abv, the 2016 pings with lime flower & meringue sorbet notes, grounded by Monforte minerality, & sings of spring & summer! 2016 Barbera d’Alba, Ferrione, Monforte d’Alba – 15%, bottled March ’17, aged in a single Veneta Botte from their Ferrione vineyard (15, 9, & 55 yo vines) just below the cantina itself, high up on grey marne soils facing pure west, unsurprisingly dark plum in colour, dense blueberry, black pepper, licorice, kirsch spirity, fondent choc, full, cool rock, sapido, energetico, yet emphatic & generous…Fantastico! With this wine one understands why Monforte is famous for its Barbera! 2015 Barolo, Monforte d’Alba – tasted Nov’18, soon to be bottled in Dec’18, macerated for 27 days, from their four vineyards: San Pietro, San Giovanni, Ginestra & for the first time, Pajana (actually part of greater Ginestra, but shouldn’t be! ): compact, presenza, red berry sultry, alpine herbs, coiled, beautiful poise, cherry stone, balsamic, curry notes even. So transparent, relaxed (pre-bottling! ), bright, tight red berries (Pajana? ), stellar! 2014 Barolo, Monforte d’Alba – tasted from bottle March’18, bottled Nov’17, 13.85%, a complicated vintage that resulted in 10-30% less fruit, yet the cool year meant a slow, gradual ripening, wrapped up by the excellent late summer, from ferragosto (15 Aug) through Sept & until the late 20th Oct harvest. With this in mind, the Conternos decide to restrict the time on skins to 20 days, followed by 18 mths in mostly botti grandi. The result is compact, fresh, focus, very minerale, salivating even, distinctly marnoso, beautifully structured, sweet red core, unresolved, pinched but also poised for further development. Needs 6 mths at least in bottle to come together. A true Barolo del comune di Monforte d’Alba! Patience required. 2015 Barolo Ginestra, Monforte d’Alba – tasted Nov’18, bottled in Aug’18: composed, minerally, finely interwoven, recalls the stricter sinewy expression of Serralunga d’Alba just across the valley; taut, compact, lovely ripe fruit tannins, a tight weave, & a meat of minerality, very clean & pure. Promising. 2014 Barolo Ginestra, Monforte d’Alba – 14.08%, tasted March’18, bottled Nov’17, total 3,280 produced! Vinified in s/s & cement, 22 days on the skins, then 24 mths in botte grande (nuovo). Compared to the Barolo di Monforte, their Ginestra is darker yet a brilliant hue, crystalline, gleaming, brambly red fruit, transparent, distinctly balsam oil, curry/turmeric notes even, whiff of seared meat; complete, dry rose petals, richer in texture than the Barolo, more purposeful sii! With a more assertive structure, squarer, Monforte tannins coupled with sweet ribes fruit, concreto/definite, racy, salty…shy, still its shell. Patience required for this most noble of Barolos! 2013 Barolo Ginestra, Monforte d’Alba – bottled Aug ’16, tonneaux/botte grande/cement, first debuted in 2010, this is very much the Sori Ginestra plot, lying perched above that of their kin Conterno-Fantino (from whom Diego broke away completely in 2000). Cupo, brambly iron character, sotto spirito, dark, brooding, closed, tamarind, dried fruit, almost distilled balsamic richness, seared meat (carnoso), shoulders, & deep seated tannic power, yet with a gleaming red pearl of sweet cassis fruit at its core… first year of the Stockinger botte grande. Needs time in bottle…. …retasted Nov’18, this wine has now gone into a hole! Patience required!